Some underground areas are reported to have lichen growing on the stone walls in distinctive forms. These forms can resemble letters, runes, sigils, ideograms, or simple shapes like circles or arrows. For the inexperienced these markings may seem purposeful; a thick "M" in Futhark signaling "go east." Experienced explorers will not be so easily fooled by the naturally occurring lichen. However, even experienced parties have been misled by using these runes as waymarkers. 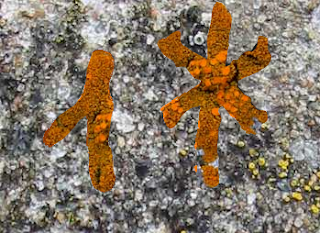 For, after exposure to light as strong as a torch, the Fool's Runes lichen will have a burst of growth. It takes the lichen at least a turn to metabolize this light energy. This growth is not so much a simple increase in size as a change of shape and location as the lichen grows towards the light source. Many an adventurer has become hopelessly lost on seeing a "B" rune where the "M" once was. I like it. Interesting idea - esp. caught my attention as I'll be introducing runes into my upcoming campaign in a big way. Thanks. I love alphabets and runes and heiroglyphics. Have fun with the runes!